The Tavistock Canal opened in 1817, having been 14 years in the building. Barely four and a half miles long, it had an active life of little more than half a century; unconnected to any other inland waterway, it survives to this day as a leisure resource and a feeder to one of England’s few hydroelectric power stations. The story of the canal is interlinked with that of the mines in the Tamar Valley. For many years the canal company also managed mines and the canal’s course was deliberately laid out with a view to intersecting as many mineral lodes as possible. Mining entrepreneur, John Taylor, was involved in its construction and management as well as the development of mines which were a direct consequence of the canal. The book is fully illustrated with contemporary photographs, maps and most notably with Robert’s superb measured drawings of the canal and its ancillary structures. 500 pages may seem a lot for the history of a canal which had such a short life; it is important to stress that it covers not only the canal itself but the history and industrial archaeology of its whole catchment area. This includes the mines, quays, tramways and plateways connected with the canal and its operation. 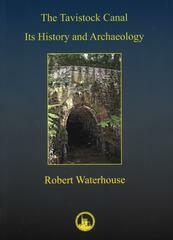 This is a major and definitive study of this part of the Tamar Valley and readers will be surprised at the variety of technology used there in the early nineteenth century.